The Charlotte Bobcats' advertising campaign for the 2009-10 season begins today. They're expanding last year's "Play the Right Way" campaign, which is based on head coach Larry Brown's basketball philosophy. 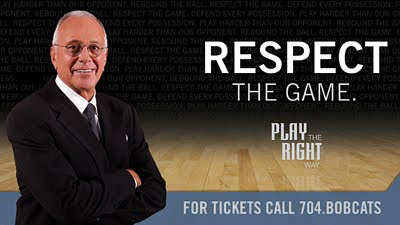 Through advertising in print, electronic, outdoor, and web-based media, the campaign features specific language used by Brown, including ‘defend every possession,’ ‘rebound the ball,’ ‘play harder than our opponents,’ and ‘respect the game.’ Those phrases are placed next to photos of Brown. As the team points out in a press release, this branding makes "the connection between his ideals and the Bobcats brand, and remind fans that under Brown’s direction last season the Bobcats set franchise records for wins, home wins and longest win streak by playing his style of basketball." I agree, but I also think it says more than that. This campaign doesn't seem that it will be using any of the Bobcat players, as they have been prominently featured in the past. I think this says a couple of things: 1) Larry Brown is currently the biggest star on the team. 2) The future of the players the team would want to market is uncertain. Addressing my first point, I think hiring Brown was the best move the Bobcats have ever made, and it was proved in his first season last year when he had the team contending for the playoffs and actually had fans excited about them during the last month of the season. But for a professional sports franchise, it's never a good thing when the coach is the biggest name on the team. I mean, the Lakers have Phil Jackson, but they also have Kobe Bryant. Which leads to my second point. The Bobcats have never had that one player on their roster that fans will turn out just to see, that little kids feel they have to have that replica jersey of. But what the Bobcats had managed to do is build a core of well-likable players that fans and the community embraced. But they traded away one of them--Emeka Okafor (though that was a good salary cap move)--and the others could be the subject of trade rumors at any moment--Raymond Felton (who they have yet to reach a contract extension with) and Gerald Wallace (the high-flying, hustling forward who is appealing to many teams). So I'm pretty sure the Bobcats decided not to build an ad campaign around players who might not still be with the team by season's end. It would've been great if the Bobcats' advertising campaign would be including both Coach Brown and some superstar player they'd acquired this offseason (Tyson Chandler doesn't quite fit the bill). I blogged back in April about a trade scenario that could bring Allen Iverson to the Bobcats. A.I. is frantically looking for an NBA home and has mentioned Charlotte on his short list of where he'd like to go. And even though Brown has said he would love to coach Iverson again, he's also talked about how difficult it would be to make that happen when the team is already loaded with guards. The Bobcats desperately need a reason for people to come to home games this season. The team is dealing with budget shortfalls just like everyone else, and this economy is in even more of a recessed state than last season, which means people are going to be even more selective with their spending. Coach Brown is a good draw, but a big-name player is a better one. Look for the "Play the Right Way" campaign to begin appearing on television commercials on Time Warner Cable, banner ads on charlotteobserver.com, and Adams Outdoor billboards around Charlotte. For more on the Bobcats, visit www.bobcats.com. Sad, but not as sad as the Bullets of the 90s which would not even bother to promote ANY part of the team, just tried to sell tix based on other teams' stars. Is This a Playoff Team?